The principal field guide for California mushroom hunters has long been Mushrooms Demystified, but its current edition is now over 25 years old and increasingly is showing its age. Although David Arora is planning to do a revision or new edition of his classic work, it will be at least several years before it will be available. However, three other field guide projects have been underway in the Golden State and the first of them has hit the street. Field Guide to Mushrooms of Western North America is a re-do of the 1979 Mushrooms of Western North America by Robert and Dorothy Orr. Although U.C. Press retained the geographic scope of The original in the new book’s title, the focus is mostly on California, which is home to all three of the authors. Michael Davis is Professor of Plant Pathology and Robert Sommer is retired Professor of Psychology at the University of California, Davis, and John Menge is retired Professor of Plant Pathology at U.C. Riverside. Davis is engaged in the study of russulas, Sommer is an amateur mycologist who paints and writes for popular mushroom journals, and Menge has provided guidance to amateur mycologists in southern California for many years. This is a relatively small-format (page size is about 7.25 × 4.5 inches) guide to about 300 species. The content and organization are fairly typical for a field guide. The 43 pages of introductory material includes what is a mushroom?, fungus ecology, collecting mushrooms, mushroom cultivation, and toxins. This is followed by an up-to-date overview discussion of mushroom classification, a quick picture key to the main morphological groups, and a set of general dichotomous keys to species or genera. Unfortunately, the entry point for the latter is knowing whether your mushroom has basidia or asci, which requires a microscope, and the simple picture key fails to indicate where you should go once you’ve determined the group to which your mushroom belongs. The two types of key should have been coordinated to facilitate their use by folks without microscopes. Next comes the descriptive part (about 350 pages), which also includes keys to the featured species. They include many of the commonly illustrated species that appear in nearly every field guide, but also a number of newly described species from California such as Amanita vernicoccora and Cortinarius xanthodryophilus. Lastly, the back matter includes a section on fungus arts and crafts (sketching, artistic spore prints, painting with puffball spores, mushroom postage stamps, photography, mushroom dyes, fungus fairs, and watercolor painting), a genus-by-genus listing of spore-print colors, a list of “other” names that have been applied to many of the included species, glossary, list of print and Internet resources, acknowledgments and art credits, and index. I particularly like the inclusion of the list of synonyms, changed names, and misapplied names. However it would have been helpful to see an indication for each entry of whether it is a misapplied name, synonym, or whatever, as the distinctions are important. The original in the new book’s title, the focus is mostly on California, which is home to all three of the authors. The descriptions follow a standard format (modified as necessary to apply to the non-gilled species)—cap, gills, stalk, spores, habitat, and edibility, followed by commentary that addresses things like recognition of similar species and uncertainty in the application of names. Like the rest of the book, the descriptions and comments are written clearly and they reflect the current state of knowledge about relationships and usage of names. The species names do not include the authorities. Common names are given where they are in general use and, although synonyms are not routinely listed, “other names” are given in some cases. Each of the featured species is illustrated with a color photograph, most of them about 3 to 3.5 inches wide. Many of the photos are good to excellent and show the features necessary for identification purposes such as the hymenium, stalk base, and staining. However, some are of lesser technical quality (mediocre lighting or color rendition, etc.) and/or fail to show necessary features such as the volvas of several of the amanitas. In addition, I was disappointed to see the authors use a number of European photographs to illustrate western North American mushrooms. Although in the text they commendably make the point that there are problems, or at least uncertainty, using European names for many of our fungi, they inexplicably use European photographs for species such as Amanita pantherina, Amanita phalloides, Gyromitra esculenta, and Xylaria hypoxylon, for which Californian photos should have been readily obtainable. In a couple of cases, the photos appear to not represent the species being described or the species as it occurs in the West. For instance, the one meant to portray Lichenomphalia umbelliferum sure looks to be a xeromphalina. One of the more distinctive mushrooms in the southwestern US is our unnamed version of the European Caesar’s mushroom (Amanita caesarea). Here it is described (admittedly with some qualification) as Amanita jacksonii (an eastern North American species) and a photograph from North Carolina (showing A. jacksonii) is used rather than one from Arizona or New Mexico, even though our western mushroom looks rather different from the eastern species. The keys to species are short, to the point, and seem to work well enough. One just needs to keep in mind that, for most genera, the species included in the book represent only a small fraction of those you might find and so the “answer” you reach in the key might well not be the correct one for your mushroom. 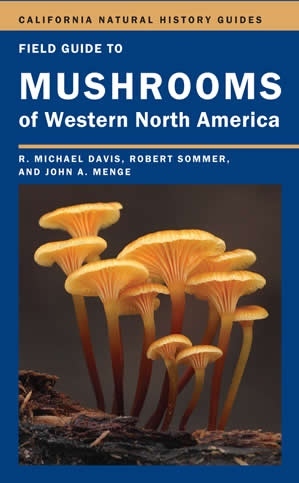 Quibbles aside, the book is well written, reasonably priced (the paper version at least), and should be a useful addition to the field guide collections of western mushroom hunters, particularly those in California. This book review appeared in the March-April 2014 issue of The Mycophile.